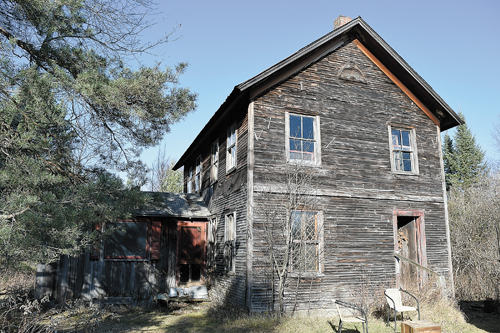 HARRIETSTOWN – For years, they sat inside a pair of weathered old barns, well out of sight of passing motorists on state Route 86. 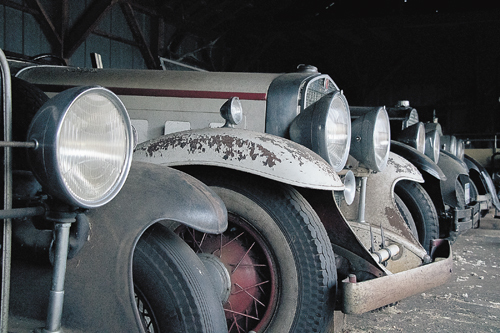 Rows of prized antique cars – Packards, Buicks, Cadillacs and Pierce Arrows – relics of another era, each with its own story. The barns are largely empty now; the cars are all gone. So is the man who acquired, repaired and cherished them. John “Hawkeye” Hawkinson died in July at the age of 83. Over the past two months, his vast and valuable collection of vintage vehicles has been sold, one by one, to dealers and restorers across the country. The proceeds from the sales will be donated to charity, as he directed. It started as a somber task for Shane Ash, who’s been in charge of selling off Hawkeye’s possessions, “but as it’s gone along, we’ve realized we’re doing exactly what Hawkeye lived his life for,” Ash said. The story of Hawkeye’s cars is the story of an eccentric collector of “all things beautiful” who shunned his family’s fortune for a simple, solitary life in the Adirondacks. Hawkeye was a master mechanic and an accomplished artist, photographer and writer. He was also a colorful character, perhaps best known locally for driving through Saranac Lake in midwinter with the top down in one of his Packards, wearing a raccoon-skin coat and smoking a corncob pipe. His name is well known among classic car enthusiasts, a notoriety that will reach a much broader audience this spring when one of the prized cars from his collection is featured on the television series “Chasing Classic Cars” on Discovery’s Velocity network. Ash admits he’s an “outsider” to Hawkeye’s story. He’s married to the eldest daughter of Hawkeye’s next-door neighbors, Rollie and Naomi Marshall. Ash and his wife Ashley lived in Kansas City until April of this year, when they moved back home and started taking care of Hawkeye, who had a close relationship with the Marshall family. “There is a very well trodden path between Hawkeye’s house and the Marshalls’ house, a testament to years of friendship, love and caring,” reads Hawkeye’s obituary. There’s another reason for the well-trodden path. Every day for 15 years, Rollie Marshall would bring a five-gallon bucket full of water to Hawkeye’s house so he could flush his toilet. Hawkeye’s house had no running water, little insulation and, until the last few years, no electricity. “He led a pretty simple life,” Ash said. That’s a far cry from the life John Whitney Hawkinson was born into on Sept. 13, 1932, in Hartford, Connecticut. He came from a very wealthy family. His grandfather Amos Whitney co-founded the machine tool company Pratt and Whitney, now a global aerospace manufacturer. His interest in old cars started at a young age. 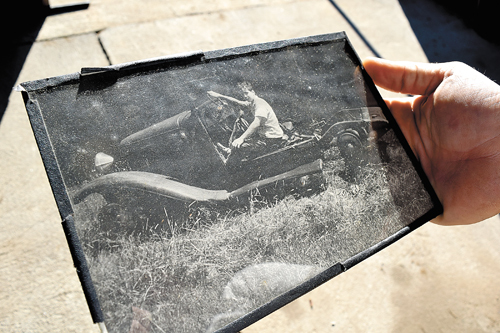 Among Hawkeye’s remaining possessions is a picture of him as an 11-year-old sitting in the chassis of an old Chevrolet on his family’s property in Connecticut. “That’s where the love of classic cars started, from a little boy in Connecticut to being here, having all these cars,” Ash said. Hawkeye went to a private boarding school and later attended the University of Vermont and Paul Smith’s College, graduating from the latter in 1953. 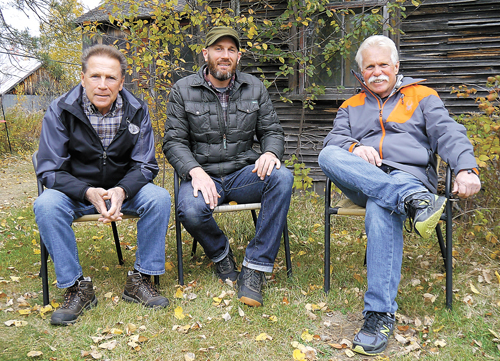 Three years later, he bought a parcel of land across from Route 86’s intersection with Darwin Brown Road, where he planned to start a classic car restoration shop. 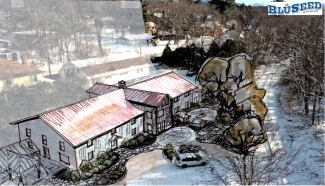 He later bought the two-story house across the street, which was moved to a new foundation on its present site. In 1959, with the help of his mother, Hawkeye built two barns to house his growing car collection. Ash said he volunteered to oversee the disposition of Hawkeye’s cars after talking with Saranac Lake lawyer Charlie Nicastro, the executor of Hawkeye’s will. 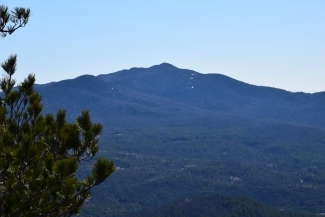 It requires that all his belongings, including the cars, be sold, with the proceeds split between the Adirondack Chapter of The Nature Conservancy and the New York Historical Society. At the time of Hawkeye’s death, he had 43 antique vehicles including cars, tractors, chassis and fire trucks from the Lake Placid, Saranac Lake and Tupper Lake fire departments. “There were two carriages, a sleigh, a 35-foot ladder truck and nine cars in this space right here,” Ash said during a recent tour of the barns. “Then, in what I call the lean-to next door, there were another 10 cars. It wasn’t hard to find people interested in buying the cars, Ash said, describing Hawkeye as a “legend” in the classic car world. His cars stayed on the property until Oct. 1, when a memorial service for Hawkeye was held. About 40 family members and close friends attended. All 43 vehicles have now been sold. The Lake Placid and Saranac Lake fire engines were sold back to their respective fire departments. The cars from Hawkeye’s collection were sold to people in Massachusetts, New York, New Jersey and as far away as Illinois. Nicastro wouldn’t reveal how much they got for all the cars, but he said it was “a lot of money. “All of those cars were very valuable,” he said. Perhaps the most valuable car, which Ash called the “pinnacle” of Hawkeye’s possessions, is the subject of the “Chasing Classic Cars” episode. It’s a rare, Belgian-made 1930 Minerva Type AM chassis with a body built by Hibbard & Darrin of France. The winning bid on the Minerva came from Wayne Carini, a master car restorer and the host of “Chasing Classic Cars,” and his friend, car dealer and restorer Ralph Marano of New Jersey. Carini said his late father, who worked for Packard Motor Car Company in Hartford, Connecticut, was a good friend of Hawkeye. He remembers Hawkeye visiting his family when he was young. “One time, it was very early on a Saturday morning, I remember my mother screaming out to my father, ‘Hawkeye’s in the driveway,'” Carini said. “He had driven all night and ended up in our yard at 2 or 3 o’clock in the morning. Rather than bother us, he just decided to sleep in the front seat of this Packard roadster with no top on it, bundled up in that fur coat I’ve since seen a lot of pictures of. Carini said he hadn’t seen Hawkeye since the 1970s. 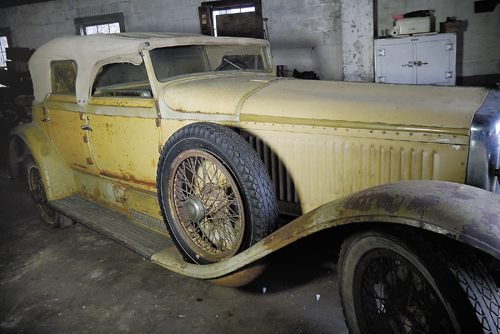 He said he found out about the Minerva from a Packard collector who had heard it was for sale. Carini said he got “tingles” when he saw the Minerva for the first time last month. “Chasing Classic Cars” is produced by Connecticut-based Crashing Wave Entertainment. Hannah Lintner, the company’s senior vice president of development and production, said the episode focused on Hawkeye was filmed on his property over two days in October. During the shoot, the film crew discovered that Hawkeye had intentionally left photos, letters and a handwritten note inside a box in the Minerva, so whoever bought it could learn more about him. 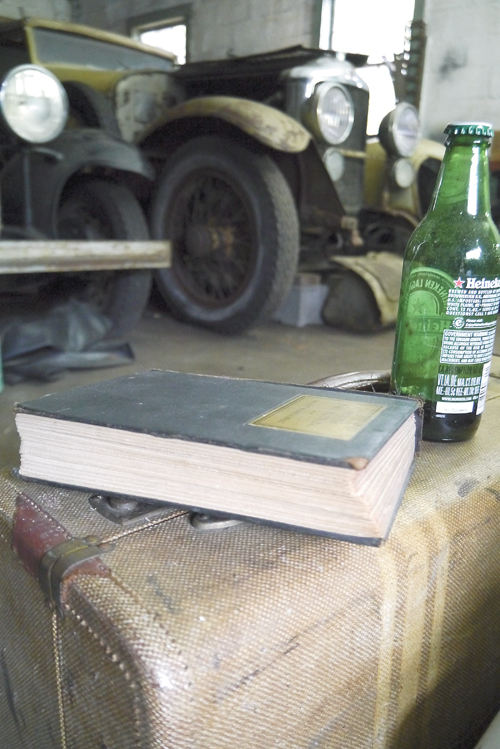 A copy of “Winner Take Nothing,” a 1933 collection of short stories by Ernest Hemingway, and an empty bottle of Heiniken were left conspicuously on a chair near the car. “You could see this is a place where Hawkeye would come, have a beer, read Hemingway and look at his cars,” Lintner said. “He knew, when he died, somebody would have to open this all up, and it would be like a time capsule for people,” Ash said. The episode of “Chasing Classic Cars” that focuses on Hawkeye’s Minerva is tentatively set to air at 10 p.m. March 7 on Velocity. Carini said he and Marano haven’t decided yet if they’ll restore the Minerva or sell it to someone else. For now, they plan to clean it up and bring it in March to the Amelia Island Concours D’Elegance, one of the nation’s biggest car shows. While all of Hawkeye’s cars have been sold, Ash is hosting a barn sale from 8 a.m. to 2 p.m. today and Sunday at Hawkeye’s property for his remaining personal effects. That includes a huge collection of vintage cameras, microscopes, projection equipment, books and other antiques Hawkeye acquired over the years. Ash said he thinks there’s a lesson to be learned from the things Hawkeye valued and the way he lived his life.